Those of us who love the Regency Era and devour novels by Austen, Heyer, and contemporary authors within the genre are familiar with the famous London hot spots. We have joined our heroines at balls held at Almack’s Assembly, eavesdropped on manly conversation over a game of faro or poker at White’s and Brook’s gentlemen’s clubs, spent our pin-money while shopping on Pall Mall, and strolled along Route du Roi (AKA “Rotten Row”) in Hyde Park. Undoubtedly we have attended dozens of theatricals and operas at Drury Lane, the Theatre Royal, and Covent Garden. And what Regency novel wouldn’t at least mention the horse races at Epsom Downs or the Derby? Our favorite Regency heroes and heroines never seem to tire of dancing, promenading, shopping, and gambling! Still, was this all they had available to entertain during those long months of the Season passed in stifling London? Did no one yearn for something different, or perhaps more stimulating… or, dare I say, scandalous? The truth is, London was (and still is) a massive metropolis with dozens upon dozens of varied amusements. For fun, I thought I’d share some of the more unusual options a bored city dweller could consider. And just to be clear, this is far from an exhaustive list! Founded by Parliament in 1753, the British Museum was the first national, public museum in the world. Located at Montagu House in Bloomsbury, the gardens opened in 1757 and the museum in 1759, with a beginning collection of over 71,000 antiquities donated by physician and naturalist Sir Hans Sloane. Initially, the collections were split into three sections: printed books and prints; manuscripts including medals; and natural and artificial productions. By 1809, this had been separated into four: printed books; manuscripts; natural history and modern artificial curiosities; antiquities, coins, drawings, and engravings. Entry was free to everyone. Over the decades the exhibits grew, with new wings added in order to accommodate. In 1842 the original Montagu House was demolished to allow for further expansion and updating. Eventually, by the 1880s, the natural history collections were moved to a new building in South Kensington. This became the Natural History Museum, but the 263-year-old British Museum is still located on Great Russell Street where it began. Definitely not your typical high-brow entertainment, nevertheless, the mobs gathered to “enjoy” the spectacle did not exclusively consist of the common folk. Those who gathered around the pillory were expected to denounce the individual and uphold the rule of law, as well as protect the moral standards of the community. Conversely, when the public disagreed with the verdict of the court they turned the event into a demonstration against those in power. 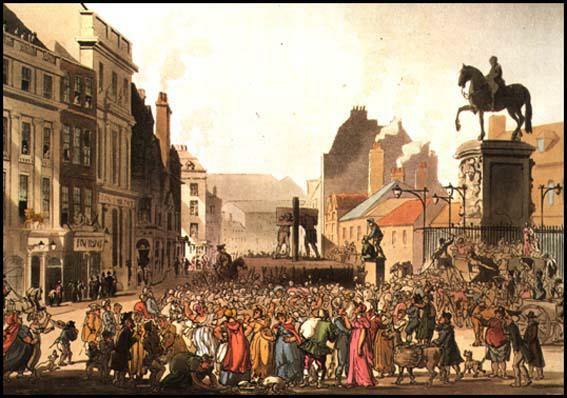 For example, when Daniel Defoe was pilloried in 1703 for libel, the crowd covered the pillory in flowers and gave him an ovation when he arrived at Charing Cross. In 1816, the pillory as a form of punishment was abolished except for certain crimes such as perjury. The Royal Institution became the inspiration for three additional educational institutions during the Regency but is the only one to remain to the present day. The London Institution followed in 1806, preceding the University of London (founded 1826) by making scientific education widely available in the capital to people such as the Dissenters, who adhered to non-orthodox religious beliefs and were consequently barred from attending Oxford or Cambridge. Lasting into the 20th century, it closed in 1912. The Surrey Institution in Blackfriars was founded in 1808, modeled after the Royal Institution and London Institution, and dissolved in 1823. Fourth of the institutions was Russell Institution, founded by private subscription, also opened in 1808. It was relatively long-lived, being listed in the 1881 Post Office directory, but not in the 1891 directory. In 1743 the land was purchased by William Kemp. He enclosed the pond with stone edging, added marble steps and a gravel bottom. Renamed the more enticing Peerless Pool, it was London’s first outdoor public swimming pool, measuring 170 ft long x 108 ft wide and 3 to 5 feet deep. Bathers dressed in a vestibule made of marble.